Click here to explore Open Water! In addition to our traditional coverage of kayak touring, Open Water relates unique aspects of all paddlesports, covering everything from kayak fishing to stand-up paddleboarding (SUP). Thye publishers of Sea Kayaker magazine selected the title Open Water for its roots in our history; Open Water was the working title for what became Sea Kayaker magazine back in 1984. We switched to Sea Kayaker, because we felt Open Water was too broad a title and didn’t tell our readers precisely who we were. Today we welcome the breadth Open Water gives us to incorporate a variety of paddlesports in our coverage as we continue our own evolution within the ever-evolving paddlesports industry. With an initial readership of 15,000 readers who are primarily sea kayakers, we will relate the new topics back to sea kayaking. As the readership diversifies, so will our coverage. Open Water’s paddler-to-paddler structure provides an ideal venue for paddlers of all writing abilities to share their experiences and knowledge. We are looking for contributors, primarily from the paddlesports industry, so if you are an avid paddler looking for the opportunity to build your reputation, we would like to hear your ideas for stories that pertain to Open Water. We also invite manufacturers and Sea Kayaker readers to participate in a forum-format response to topics presented, giving everyone the opportunity to tell their story and earn feedback. We hope you enjoy Open Water. Happy paddling. Not subscribed to Open Water? Click here to sign up for free! Plans were unveiled Monday for the South Shore Blueway Plan, which will establish a kayak trail through the mashes and bay’s of Long Island’s South Shore. The Blueway stretches 18 miles from the western boarder of the Town of Hempstead to the Nassau/Suffolk County line. The plan took share as part of the 2006 Environmental Bond Act. Planning began last year. In November of 2008, the Village of Freeport joined with Nassau County to obtain funds from a Local Waterfront Revitalization grant from New York State. A water trail is designed for people to use small, non-motorized beachable boats like kayaks, canoes, day sailors or rowboats. There will be various launches, rest stops and shoreline facilities along the way, officials said. A key element of the plan is sustainability, using green technologies for paths, ramps or any other item that needs to be built. The access plant will also be ADA compliant. The plan calls for interpretive and educational opportunities that will encourage understanding of the South Shore ecosystem and maritime heritage. According to the project’s website, which you can access by clicking here, the Blueway includes two inlets, four bays, seven new access points and nine boat ramps. For a full list, click here. The public is invited to share comments during a community forum on Nov. 14 at 6 p.m. at Freeport Village Hall’s conference room. Participants will have the opportunity to ask questions. During the 30-day comment period, questions and comments may be submitted to info@southshoreblueway.com. This class has been in such high demand we added an extra pool class before the season gets underway. Join in the world’s fastest growing sport. Are you nervous or just plain scared about tipping over? Cost is $73.00. Please call Paths Peaks & Paddles at 716-213-0350 if you have any questions. Paths Peaks and Paddles is teaming up with the Williamsville Community Education to present this session. You do not have to be a resident of the Williamsville to sign up. You can sign up on line at: Williamsville Community Education (direct link) or by phone at 716-626-8080. 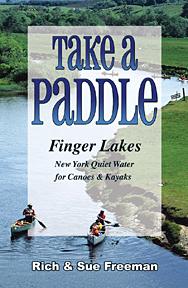 Once you learn the basics, go explore the wonders of Western NY, using the guidebook “Take A Paddle – Western New York Quiet Water for Canoes & Kayaks,” available here as a pdf file e-book. 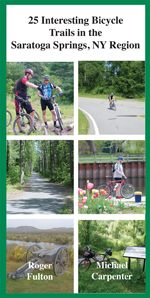 Paths Peaks & Paddles, Inc.
For the first time in more than a century, thousands of acres of Adirondack land around the Essex Chain of Lakes is open to the public for hiking, paddling, skiing, fishing and hunting. Held for years by the Finch Pruyn timber company, the lands were opened for public access Monday under an interim plan by the state Department of Environmental Conservation. In August 2012, the state bought 69,000 acres of former Finch lands from The Nature Conservancy, which had bought it from the timber company. With the opening of the Essex portion, about 22,000 of these acres are open to public recreation, which permits day use, but not overnight camping. Motor vehicle access to Essex lands is open on Cornell Road and on the Boots to Cornell Road. Cars and trucks are allowed to drive on Cornell Road from Woods Road to a gate on the Boots to Cornell Road. A parking area allows access to Deer Pond. 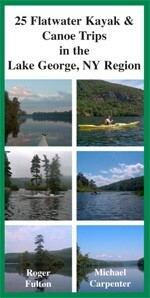 Paddlers may portage canoes and kayaks about a quarter mile to Deer Pond. From there, a half-mile portage reaches a put-in on Third Lake. 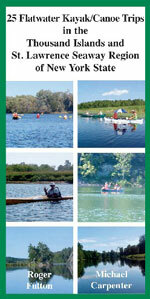 Paddlers can travel by water to explore First, Second, Fourth, Fifth and Seventh Lakes of the Essex Chain. Members of private hunting camps that held leases with Finch retain rights that permit motorized access not available to the public, and also have one-acre exclusive-use envelopes around their camp buildings. The publisher of the Common Man outdoor trail & paddle guides for NY, FL and VT has had a major webpage meltdown. As a temporary sole source, the webpage at www.RogerFulton.com has become the backup and the only current online source for most of the Common Man trail guides. The only glitch is that this web page can’t take credit cards, but can accept cash, checks or money orders by mail. Common Man Books are a great source of trail information for Lake George, Saratoga Springs, the 1,000 Islands,and Adirondacks fire towers. Many of the links in this blog to Common Man books will be dead. Click here instead. A new level of innovation for recreational kayaks. Created by award-winning design engineer Magnus De Brito, Point 65 launches the Tequila! A fun, versatile and high-performance kayak that, due to its modularity, is exceptionally easy to carry, store, and haul. The revolutionary solo or tandem combination is the solution you were waiting for. Click here to see models. Click on details for one & scroll down on the page to watch videos.